Anime Expo, or AX, as it is known to its fans, it's Los Angeles biggest Anime expo, taking over all of the Los Angeles Convention Center and showcasing anything anime related, with panels, signings, movies, after hour dancing, cosplaying, you never have a dull moment on 4th of July weekend! Unfortunately, we can't all be all places at once, so we will concentrate on what we did get an opportunity to attend. Every year there is that one "must go" panel, and this year wasn't the exception. We made our way to the Overwatch panel, where we got a full hour with lead writer Michael Chu and voice actors Anjali Bhimani (Symmetra), Charlet Chung (D.Va), Fred Tatasciore (Soldier: 76), Jonny Cruz (Lucio) and Keith Silverstein (Tjorborn). The energy was very high, with fans laughing and engaging the panelists throughout. They talked about what they do for inspiration, what type of music they listen to, pineapple and pizza? All in all it was a fun hour. After Overwatch, we went to the Attack On Titan Panel with the Japanese voice of Mukasa,Yui Ishikawa, the English voice actor Trina Nishimura & Producer George Wada for an hour talk about the show, showing clips and talking about the difference between the English and Japanese scripts and comparison between the manga and the show, which contained lots of spoilers for season two! After the film, panelist included Kevin Dorman (Chris Redfield), John DeMita (Glenn Arias), Alex Von David (ADR Director), and Mami Okada (Casting Band Zoom! Entertainment) came out to talk about the film and have some fun with the audience. We were all glad to have another entry on the animated version of the series, got to hear how it all came to be and what to expect from the future of the franchise! 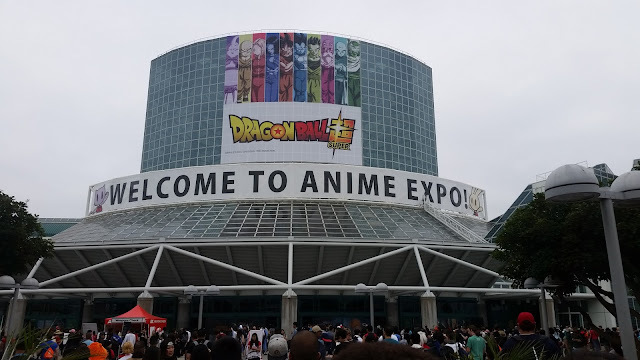 More to come on day 2 of Anime Expo!